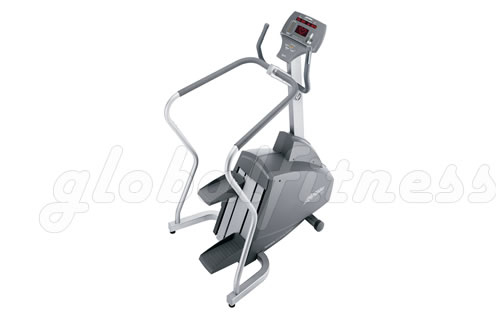 When you're ready for a top-of-the line commercial stair climber, hop on the Life Fitness 95Si Commercial Stepper. Sturdily built with wide foot plates to push on, the 95Si comes with the unbeatable Iso Track Climbing System. The 95Si further emphasizes user ergonomics with its precisely placed handlebars which provide support and put you in the proper upright position for an all-out workout. While you're moving through the 26 available programs, with 5 zone-training options, you'll be able to monitor your heart rate and other important workout data with the 95Si's patented Lifepulse™ digital hand sensors, or wirelessly, via a Polar® telemetry chest strap. The 95Si will go anywhere in your home or gym - it has front wheels for easy mobility, and is self-powered, requiring no complex collection of cords. This high-powered stepper gives easy-to-understand feedback from a dual level alphanumeric LED console. For further viewing capability, the 95Si offers the option of an attachable LCD TV. The weight of the 95Si is only 165 portable pounds, yet it can support a payload of up to 350 lbs. You can also enjoy your workout on the 95Si in up to 9 languages and work with an integrated reading rack and accessory tray. Dimensions: 48" X 32" X 64"